It has happened. As it does every Spring. 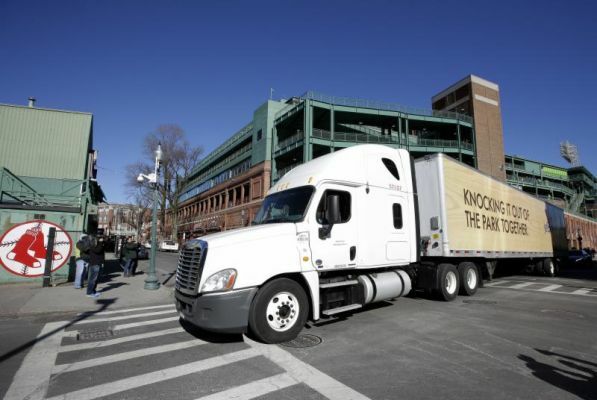 The Red Sox equipment truck has departed Yawkey Way for parts south—Fort Myers, Florida to be exact. A swarm of fans—still groggy after celebrating the Patriots' fifth Super Bowl Championship—gathered around the vehicle like the sacred entity it is. No incense were seen—but it might as well have been wafting in the cold February air. In any event, it is on its mission to deliver bats, balls, gloves, jocks, whatever for the 2017 edition of your Carmine Hose. Forget the groundhog or the crocus or the robin—this is the first true sign of Spring.